Mark boundary lines on grass or stabilized outdoor sporting fields with ARCALINE. ARCALINE, a copolymer acrylic water based product, is a ready to use paint designed to mark boundary lines on grass or stabilized outdoor sporting fields: football fields, rugby fields, lawn tennis courts, golf courses, fairgrounds, school recreational areas. Mark boundary lines on grass or stabilized outdoor sporting fields: football fields, rugby fields, lawn tennis courts, school yards or separation lines on fair grounds. ARCALINE can be made available in RAL colours for a minimum order of 200 Litres. CLICK HERE to consult us. can be used for short term marking on sports fields, golf courses, fairgrounds, etc. 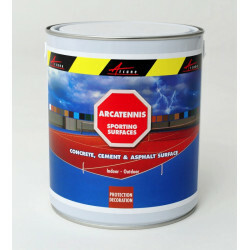 ARCALINE can be ordered in any RAL colour for a minimum order of 200L. Standard lines are obtained by mixing 1 volume of ARCA-LINEMARK with 4 volumes water. To obtain a brighter white line, dilute 1 volume product with 2 or 3 volumes water. Stir to mix the product thoroughly before application. Apply with a field striping machine or sprayer. Drying time will vary depending on the air temperature and relative humidity.